Condo MH909 - Beautiful Views, Amazing Condo! Welcome to Moose Hollow MH909! Stay in the epicenter of adventure and beauty at the Moose Hollow Condos. Surrounded by mountains and pristine views, MH909 is just mintures from Powder Mountain Resort, Pineview Resevior, and only steps away from hundreds of miles of trails for hiking and biking. Main Level: Kitchen, living room with TV, full bathroom, balcony, and bedroom..
Upstairs: Bedroom with ensuite bathroom, and laundry room. Bedroom 1: 1 Queen bed with full hallway bathroom. Queen Sofa Sleeper in Living Room. Bedroom 2: 1 Queen suite bedroom with ensuite bathroom. Come stay with us in Moose Hollow and enjoy some of the best outdoor recreation in Utah and the greatest snow on earth! 50% deposit is required at the time of booking in order to confirm the reservation. The balance is due 30 days prior to arrival and will automatically be processed by us. The deposit is refundable (less a $30.00 cancellation fee) if canceled 60 or more days before arrival or if we are able to fill the reservation within the 60 days. Standard Check-In Time is 4:00 p.m.
Standard Check-out Time is 11:00 a.m. There is also a one-time processing and departure cleaning fee required and is priced out during the reservation process. 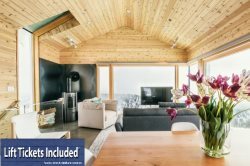 We are truly excited and honored to share our homes with each and every guest and we invite you to stay with us at Powder Mountain Getaways - MH909! The community HOA complex is a 3000 sq. ft. Clubhouse that can be reserved for private functions, and it has a small fitness center in the lower level. On site there are enjoyable walking trails that meander throughout our community past streams, ponds, waterfalls and fairways. During ski season, there is fee based shuttle service to Powder Mountain offered by the Utah Transit Authority (UTA) which comes right through the Moose Hollow Community. Please click here for shuttle information. Powder Mountain is a unique resort that is sure to blow your mind with its untouched powder, amazing, views, and stellar vibes. The condos are located in Eden, UT which is approximately 6.3 miles down-mountain from Powder Mountain’s Timberline Lodge. Eden is home to several shops, eateries, a grocery store, and one gas station. We recommend having a rental car during your stay with Powder Mountain Getaways. During the winter months, it is important that you rent a 4x4 or AWD vehicle, and you must be comfortable driving steep snowy roads. Doesn’t sound like your thing? No worries, the state of Utah does run a shuttle bus up and down the mountain. If you rent a Ski-in/Ski out home, you will be at the top of the mountain, where there are no services, stores, or restaurants after the resort closes. Having a vehicle is highly recommended when staying on-mountain.